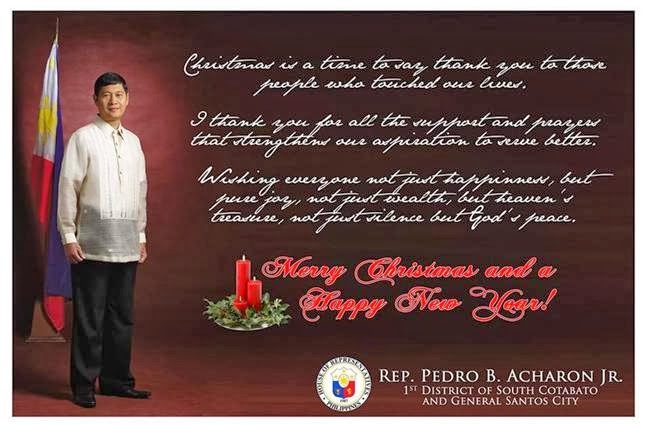 Christmas Message from Cong. Pedro B. Acharon Jr. Here is the Christmas Message of Cong. Pedro B. Acharon Jr. to all his constituents in General Santos City and the 1st District of South Cotabato composed of the municipalities of Tampakan, Tupi and Polomolok. people who touched our lives. that strengthens our aspiration to serve better. treasure, not just silence but God's peace.